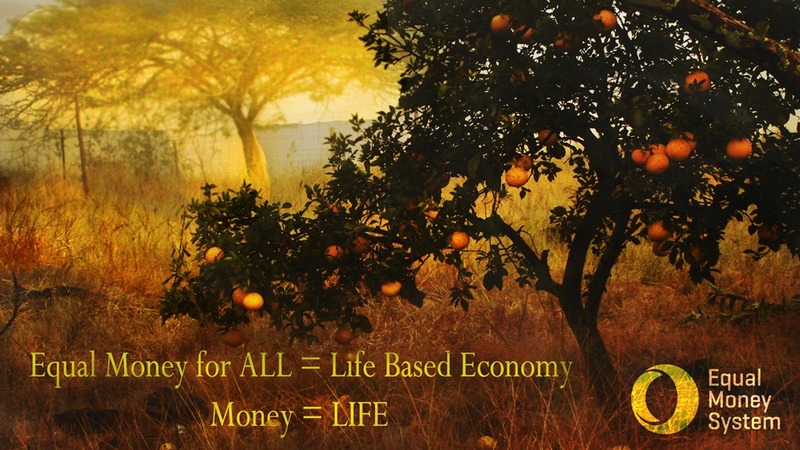 In an Equal Money System the human being will reintegrate himself as a full participant of nature – where nature is not just something ‘out there’ anymore – something we ‘visit’ once in a while when we want to ‘get away from it all’. Instead, nature is part of our world and we are a part of nature. This means a rediscovering of what it means to be a human as a physical being and a redefining of our relationship with our environment. In order to best support ourselves, we require to best support that which supports us: which is nature. The challenge before us is therefore to restore the Earth to a state of being where it can operate in optimal conditions, as a smooth-running life-support system. Where the human is involved with animals and plants, the human will monitor the well-being of those plants and animals and become a care-taker of the area that they are occupying – because there is a human impact. Any form of problematic development, such as soil erosion or human waste, as a result of human impact – requires to be managed by the human. Where humans are not a part of the environment, nature will take care of itself. For instance, if a certain animal or insect increases in numbers to such an extent that they become a negative or destructive impact on their environment – the forces of nature will bring about equilibrium through, for instance, some form of natural disaster that reduces the numbers. Those kinds of natural disasters, which bring about a new form of equilibrium, are part of the distribution cycle of nature. Or if, for instance, a rabbit population expands too rapidly in a certain area – it will cause predator birds to have more access to food, allowing more of them to survive and reproduce. Eventually these birds will be so big in numbers that they will reduce the rabbit population back to where it was. Having less food available, the birds will also reduce in numbers again. So, nature has a variety of ways to correct situations of disharmony and imbalance. Unlike human beings, animals and plants are very proficient in using the least possible resources. They don’t have the tendency to simply hoard for the sake of having. That is why the form of competition that occurs within nature brings about actual equilibrium, whereas this is not happening in our economic system – because animals and plants will only compete for what is necessary and understand that if their environment as a whole exists in the most optimal way – they themselves will benefit most. Therefore, we will not be tracking every animal and plant to monitor the well-being of each life-form, we will, in essence, be tracking the human impact on nature. This will enable us to assist nature in re-establishing equilibrium where it has been lost. Our role as a human will thus be to rehabilitate nature as a steward so that it can correct itself and re-establish its expression into what it is meant to be. It must be understood that nature, as a life-support system, has inherent value and that its importance does not only extend in so far as it gives us nice experiences – when we go to the beach or go for a safari-trip. Those experiences are of secondary importance and may not interfere with nature’s expression and optimal functioning. As said above, our interaction with nature will change, where we are not just ‘enjoyers’ of nature, where we no longer merely sit back and ‘enjoy the view’ – but where we are active participants – identifying where nature is struggling to maintain itself and step in with rehabilitative programs and projects – and thus, become a part of the flows of give and receive.